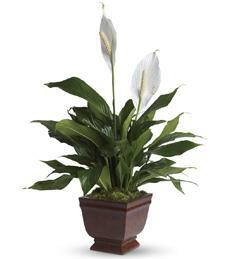 Open your heart and soul for A Peace of My Heart peace lily that symbolizes love, peace, and forever unity with that special someone. 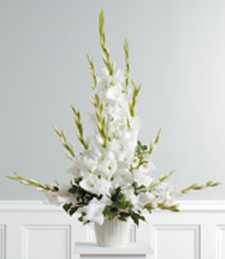 Grace the moment with a delicate gift that exudes that spiritual uplift that grieving somone can embrace. 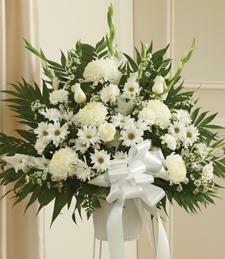 Shimmer and shine amongst that grieving loved one and be that special friend in a time of need. 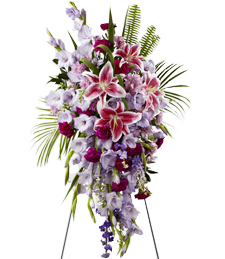 Radiant ravishing fresh florals illuminate in a vast array of lavender, purple, and deep pink hues to highlight that delicate occasion as a farewell to a life well-lived. 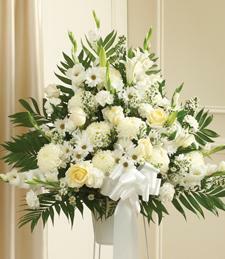 Take that special someone away on a vacation away from their grief and troubles with a Fresh Ocean Breeze Sympathy Urn. 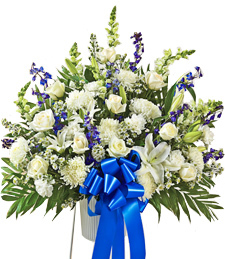 Deep ocean blue and glimmering white blossoms shimmer and shine like the rippling waves of fresh ocean waters. Sooth their pain of loss with a touch of natural healing from a brush of ultimate nature. 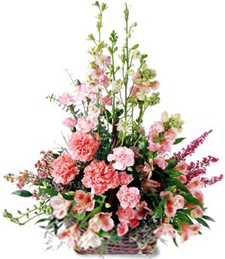 Honor a truly beautiful and unique soul with this lovely mix brimming with exquisite flowers. 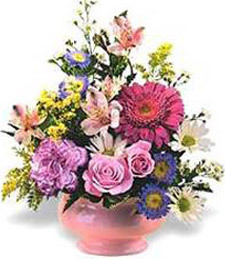 Add comfort and support in these difficult days--send today! 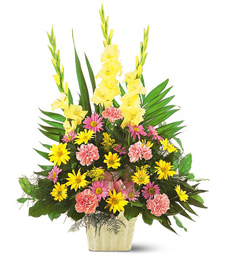 Pay tribute to a cherished friend or loved one now at rest with this exquisite urn arrangement, brimming with stunning pink and yellow flowers. 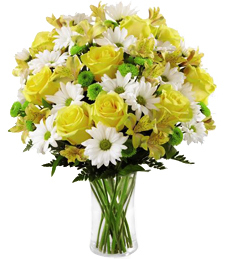 These blissful blooms are a truly heartwarming and touching gesture of your deepest sympathy, support and fond remembrance. 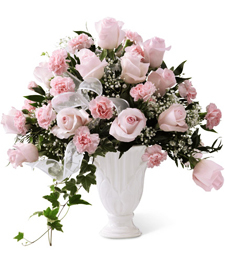 Glistening white and precious pink blooms shimmer and shine with the most charm and charisma ones eyes can capture of a Precious Souls Standing Basket. Give them wings and set them free in this difficult time of grief for the pain of loss is only a temporary passing. Wander away with Timeless Traditions with the perfect collaboration of creative artistry of glimmering refined blossoms. Guide that special someone in need down the path of uplifting inspiration. Show them you care with a gift that words cannot express. 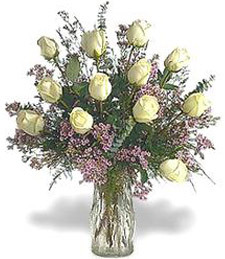 Precious pastels in naturally beautiful shades of invigorating green, shimmering white, and precious pink together in unison for a picture perfect token of unconditional love and compassion in a time of sacred healing. 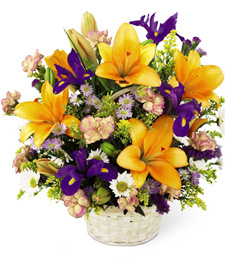 Give that special loved one a Dazzling Aroma Standing Sympathy Basket and wash away all their troubles. 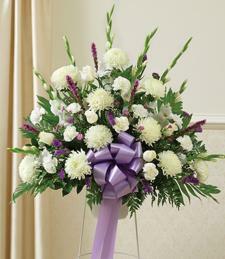 Grace the Mists of Heaven with a perfectly designed touch of gentle shimmering blossoms in shades of tranquil white and mystic purple in a standing sympathy basket as a simple display of compassion in difficult times. Guide them down the pathyway of healing and their gratitude will never be forgotten. Blushing pink blossoms in the shade of rosewater is the ultimate lavish luxury so perfect for that delicate occasion. 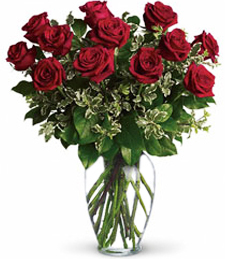 Send a simple token of your sincerest affections and your generosity will be rewarded. 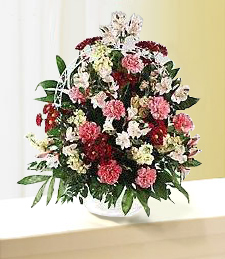 Honor the life and memory of a beloved friend or relative with this exquisite standing spray, brimming with a medley of white, pink, red and yellow flowers. 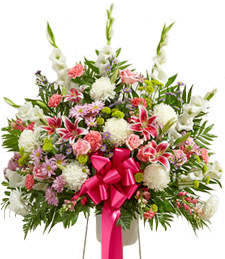 Exuding nature's beauty and grace, this arrangement is a truly loving and heartwarming expression of your deepest sympathy, support and fond remembrance. 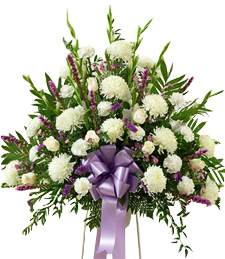 Ignite those precious moments with a Lavender Memories Sympathy Basket perfectly designed with a touch of gentle shimmering blossoms in shades of tranquil white and mystic purple in a standing sympathy basket as a simple display of compassion in difficult times. Guide them down the pathyway of healing and their gratitude will never be forgotten. 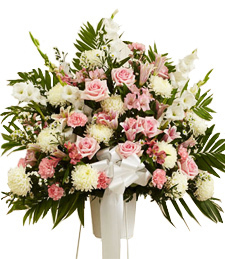 Delicate yet bold, this brilliant arrangement of pink carnations will warm the heart of a departed friend or loved one's grieving family. 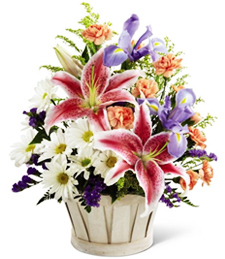 Honor their memory and life with these stunning flowers. 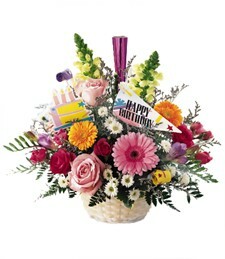 A bit of bright and lovely is the theme of the occasion. Be that extra special friend in a time of great need. 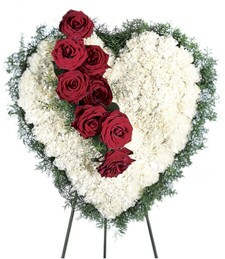 Add that extra special something for that final farewell tribute. A brilliant array of all the colors of the rainbow is the perfect touch. 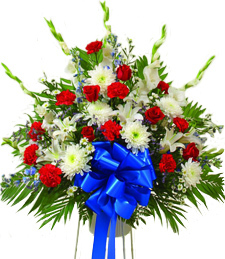 Raise your highest respects to a life well-lived with a Patriotic Stance Sympathy Basket as a tribute to that special love one. Patriotic colors in vivid shades of red, white, and blue add to that special occasion once in a lifetime.